Director – George Romero, Screenplay – Stephen King, Second & Fourth Segments Based on the Short Stories Weeds & The Crate by Stephen King, Producer – Richard Rubinstein, Photography – Michael Gornick, Music – John Harrison, Visual Effects – David Stipes, Special Effects/Production Design – Cletus Anderson, Makeup Effects – Tom Savini, Comic Art – Jack Kamen. Production Company – Laurel Entertainment. A father finds his son reading a horror comic-book ‘Creepshow’ and throws it out the window in disgust. In the gutter, the wind flips through the stories. Father’s Day:- As his family gather to celebrate the birthday of the late Uncle Nathan, a miser who was killed by his wife because she became tired of his constant complaining, Uncle Nathan returns from the grave to demand his birthday cake. The Lonesome Death of Jordy Verill:- Jordy Verill, a hayseed farmer somewhat lacking in the brain department, discovers a meteorite has fallen on his farm. He sees the potential to make money. However, when he cracks the meteorite open, he and the farm are infected and overrun by alien weeds. Something to Tide You Over:- Millionaire Richard Ames kidnaps his wife’s lover Harry Wentworth and buries him up to the neck in the sand on the beach as the tide comes in, all the while playing a video of how he drowned his wife the same way. Afterwards, the two water-logged bodies return from the dead, seeking revenge against Ames. The Crate:- Henry Northrup, a hen-pecked university professor, discovers someone has shipped a vicious creature to the university in a crate. He hatches a scheme to use the creature in the crate to dispose of his domineering, taunting wife. They’re Creeping Up On You:- The sanitised, germ-free apartment of miserly, reclusive and cleanliness obsessed billionaire Upson Pratt is suddenly invaded by cockroaches everywhere. In the late 1970s/early 1980s, George A. Romero, then the director of the cult hits Night of the Living Dead (1968) and Dawn of the Dead (1978), and horror writer Stephen King came together first when Romero was assigned to the film adaptation of King’s novel Salem’s Lot (1977). The Salem’s Lot film never happened and the project instead eventually emerged under Tobe Hooper as the mini-series Salem’s Lot (1979). Despite this, George Romero and Stephen King formed a friendship and planned a film adaptation of King’s novel The Stand (1978). Romero and King could never crack the means of either reducing King’s mammoth 700 page work to feature-film length or of getting the finance to mount the work as a two-part film. Evidently, the idea of making the book as a tv mini-series – where its length is most suited – never occurred to them or was ruled out. The project was eventually abandoned, later to be revived by director Mick Garris with a Stephen King script as the terrible eight-hour mini-series The Stand (1994). In the interim, however, Romero and King came up with Creepshow as a dry-run for the The Stand project. 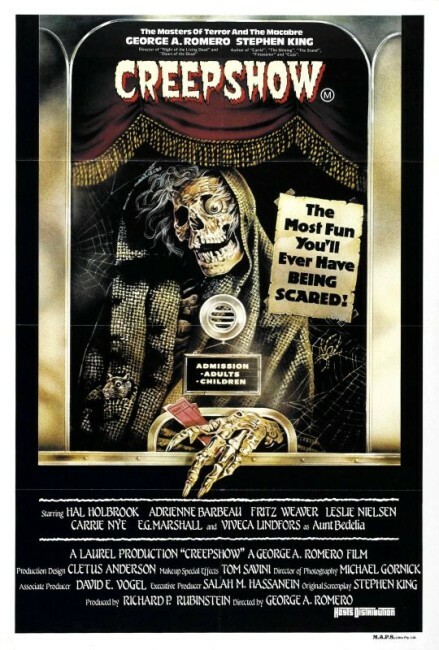 Creepshow is a homage to the old EC comics such as Tales from the Crypt (1950-5) and The Vault of Horror (1950-5) or Warren’s Uncle Creepy (1964-83) where a sinister figure would introduce a self-contained horror tale that would usually end with a black twist and an outrageous pun. George Romero and Stephen King clearly have a love of these horror comics. Unlike previous adaptations of these comics, such as Amicus’s Tales from the Crypt (1972) and The Vault of Horror (1973), King and Romero get the delicious sense of black humour and the hilarious just desserts twists that Amicus missed in their EC adaptations down perfectly. Some of the images like the corpse of Uncle Nathan emerging from the grave moaning “Where’s my [birthday] cake?” or the flash fantasies Hal Holbrook has of killing wife Adrienne Barbeau are uproarious. King and Romero have a great deal of fun creating and setting up deliberately straw figures for nasty endings – there is a wonderfully malicious scene where Leslie Nielsen buries Ted Danson up to his neck in the sand before the oncoming tide. Romero consciously mimics the nature of the comic-book, even down to framing the screen with comic panels and panning between them to change scenes with typical announcements like “The next day…”. Romero also directs the horror with considerable tension. The Crate is the most satisfying segment in this regard, filled with some wonderful Jack in the Box pop-up effects with the monster in the crate, not to mention the aforementioned murderous flash fantasies. Certainly, the brevity of length makes some of the stories such as Something to Tide You Over feel dramatically incomplete. (The best of the segments, The Crate, is also notedly the longest). The Lonesome Death of Jordy Verrill is the weakest segment, ending on an inconclusive note. Romero ropes a surprisingly good cast in, including Ted Danson who went onto stardom with Cheers (1982-93) later the same year. 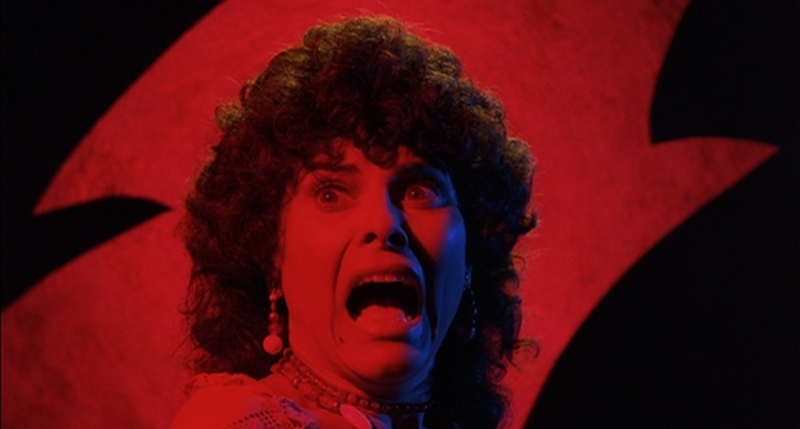 Everybody clearly has a great deal of fun, most notably Adrienne Barbeau who lets all stops go in an hilarious performance. 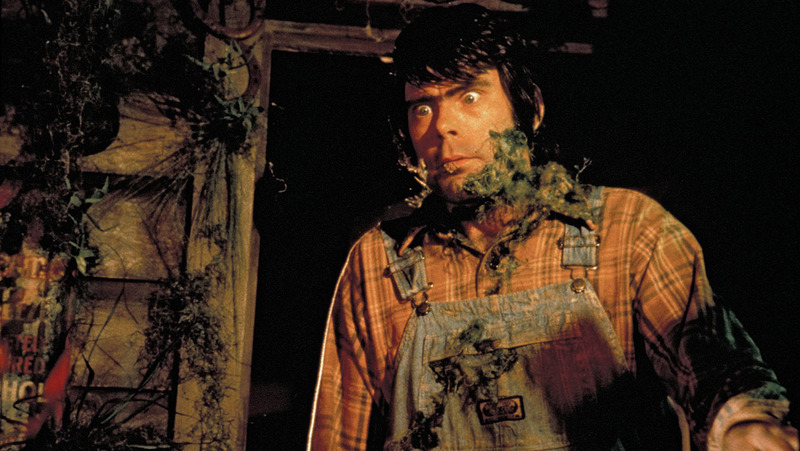 In The Lonesome Death of Jordy Verrill, Stephen King himself plays the title role, a hay-for-brains hick local, where it is best said that King should stay at what he does best – writing – rather than acting. John Harrison, himself later to become a director, delivers an excellent score. Creepshow II (1987) was a weak sequel – George Romero wrote, adapting one Stephen King story, and turned the direction over to this film’s cinematographer Michael Gornick. The sequel however lacked the black comic edge that this version has. With the renewed interest in George Romero’s films in the 00s, there was a further sequel with the universally derided Creepshow III (2006). A remake of the original was announced during the 00s but has yet to emerge. Following Creepshow, Laurel Entertainment developed a number of horror anthologies in the EC style, including two tv series’ Tales from the Darkside (1984-6) and Monsters (1988-90). Laurel also made the excellent anthology film Tales from the Darkside: The Movie (1990), which was a cinematic spinoff from the Tales from the Darkside series, and is directed by this film’s musician John Harrison, adapts one Stephen King story and is partly written by George Romero. George A. Romero’s other genre films are:– the classic zombie film Night of the Living Dead (1968); Jack’s Wife/Season of the Witch/Hungry Wives (1972) about suburban witchcraft; The Crazies (1973), an underrated film about a madness-inducing biospill; Martin (1976), a superb deconstruction of the cinematic vampire myth; his two zombie sequels Dawn of the Dead/Zombies – Dawn of the Dead (1979) and Day of the Dead (1985); Monkey Shines (1988) about a psychic link between a paraplegic and a murderous monkey; Two Evil Eyes (1990), an Edgar Allan Poe anthology made in collaboration with Dario Argento; The Dark Half (1993), from a Stephen King novel about a writer haunted by an evil doppelganger; Bruiser (2000) about a man whose face suddenly becomes a blank mask; Land of the Dead (2005), Diary of the Dead (2007) and Survival of the Dead (2009). Romero’s scripts include Creepshow II (1987), Tales from the Darkside: The Movie (1990) and the remake of Night of the Living Dead (1990). Romero has also produced Deadtime Stories (2009), Deadtime Stories 2 (2010) and the remake of The Crazies (2010). Other Stephen King screen adaptations include:- Carrie (1976), Salem’s Lot (1979), The Shining (1980), Christine (1983), Cujo (1983), The Dead Zone (1983), Children of the Corn (1984), Firestarter (1984), Cat’s Eye (1985), Silver Bullet (1985), The Running Man (1987), Pet Sematary (1989), Graveyard Shift (1990), It (tv mini-series, 1990), Misery (1990), a segment of Tales from the Darkside: The Movie (1990), Sometimes They Come Back (1991), The Lawnmower Man (1992), The Dark Half (1993), Needful Things (1993), The Tommyknockers (tv mini-series, 1993), The Stand (tv mini-series, 1994), The Langoliers (tv mini-series, 1995), The Mangler (1995), Thinner (1996), The Night Flier (1997), Quicksilver Highway (1997), The Shining (tv mini-series, 1997), Trucks (1997), Apt Pupil (1998), The Green Mile (1999), The Dead Zone (tv series, 2001-2), Hearts in Atlantis (2001), Carrie (tv mini-series, 2002), Dreamcatcher (2003), Riding the Bullet (2004), ‘Salem’s Lot (tv mini-series, 2004), Secret Window (2004), Desperation (tv mini-series, 2006), Nightmares & Dreamscapes: From the Stories of Stephen King (tv mini-series, 2006), 1408 (2007), The Mist (2007), Children of the Corn (2009), Everything’s Eventual (2009), the tv series Haven (2010-5), Bag of Bones (tv mini-series, 2011), Carrie (2013), Under the Dome (tv series, 2013-5), Big Driver (2014), A Good Marriage (2014), Mercy (2014), Cell (2016), 11.22.63 (tv mini-series, 2016), The Dark Tower (2017), Gerald’s Game (2017), It (2017), The Mist (tv series, 2017), Mr. Mercedes (tv series, 2017– ), 1922 (2017), Castle Rock (tv series, 2018– ) and Pet Sematary (2019). Stephen King had also written a number of original screen works with Golden Years (tv mini-series, 1991), Sleepwalkers (1992), Storm of the Century (tv mini-series, 1999), Rose Red (tv mini-series, 2002) and the tv series Kingdom Hospital (2004), as well as adapted his own works with the screenplays for Cat’s Eye, Silver Bullet, Pet Sematary, The Stand, The Shining, Desperation, Children of the Corn 2009, A Good Marriage and Cell. King also directed one film with Maximum Overdrive (1986).